Let's try new grips to train your pull-ups. With this grip ball you will improve your grip and warm-up your forearms. With theseGrip Balls you can experiment with new grips for pull-ups and they can also help you train your forearms using your body weight as the only load. Made from steel, their black stove-lacquered powder paint coating gives them excellent grip, so your strength is the only variable when practising your grip. The anchoring system for each ball consists of a nylon strap and a steel clamp that ensure reliable and durable anchorage. 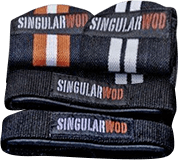 At Singular WOD we work hard every day to ensure all our products and services are of the highest quality. For this, we continuously review our quality processes, and establish new control mechanisms that help us to detect possible deficiencies in the design and prototyping stages of each of our products, as well as during the manufacturing, assembly and packaging stages. In addition, we are extremely careful during the handling and transport stages in order to ensure the products reach you in optimum conditions. But if, despite our efforts to offer you the highest quality products, you detect any physical or aesthetic anomaly, do not hesitate to contact our Customer Services Department so that we can replace your product with a brand-new one, at no cost and in less than 48 hours. You have a 2 year warranty on this product! *See our general terms and conditions. And if you are simply not satisfied with the product received, you have 15 days to return it or exchange it for a different one. Once you try it, you’ll never want another. Designed for the most demanding athletes. Robustness and smoothness in one bar. Made with rubber to absorb impacts and increase durability. Their hexagonal shape mean they are also suitable for exercises on the floor. Chrome plated handle. Our standard Olympic bar for those looking for durability without giving up a smooth rotation. Long workouts without even noticing. In addition to kettlebell training, use them in functional training or as ballast in your pull-ups. Available from 8 and 40 kg. Competition standards. A structure for large groups. Comprising 24 pull-up positions, 8 racks and 9 locations for rings.